This entry was posted in Stories on June 30, 2013 by jerrycowling. Siegfried and Otto were extremely put out that the Fuehrer had gone down into his bunker and put a bullet through his brain. There they had just created the perfect prototype of a robot soldier, ready to goosestep across Europe, and the war was over. What on earth were they ever to do? Within a year they had migrated to the United States with a brilliant new idea for their robot. Siegfried and Otto reworked the circuit to transform the goose-stepping marvel into a tap-dancing fool. They envisioned creating entire theater companies to tour with No No Nanette in every major city in America, three shows daily. Ordinary human dancers had to eat, sleep and insist on being paid, while inconveniently coming up lame with pulled muscles and sprained ankles. “He is a masterpiece!” Siegfried exclaimed. “Perhaps we should lose the mustache and the hair down the forehead,” Otto offered. “Ah! Make him a blond!” Otto jumped with glee. “You said to name him Otto robot,” Siegfried responded. “Let’s get back to the topic at hand,” Siegfried said, opening the back of the dancing robot with a screwdriver to make final adjustments. “Ah, that is it.” He closed the panel and pushed the bright red button between the robot’s shoulder blades. The robot began a perfect tap routine with shuffle ball change and butterfly jumps. Otto’s eyes widened. When Otto punched the button the robot bent its knees and flew across the floor, tapping its little feet off. Siegfried ran to his partner and wrested the screwdriver from his hand and turned to the dancing robot as it began bouncing off the walls. “Nein! Nein! No No Nanette cannot be danced like that!” Seigfried screamed. The two scientists rolled around on the floor as the dancing robot entered its final sixteen bars which included a pirouette and clicking of heels. Unfortunately on the second heel click the robot tripped over Siegfried and Otto, collapsed and its legs fell off. The scientists stopped fighting, stood and surveyed the damage. “I never liked No No Nanette in the first place,” Otto said. Each picked up a leg and went to the work table. They went back for the torso. “Of course, it will have to be programmed to dance in the style of the Bolshoi Ballet,” Otto said matter of factly. This entry was posted in Stories on June 26, 2013 by jerrycowling. This odd mental phenomenon goes back to 1971 when I was the area editor for the Kingsport, Tn., Times-News. A bunch of stringers and I were responsible for filling up a page about news from the surrounding counties everyday. Some days that could be quite a chore. Over the years my wife and I have had a good laugh over it, repeating that assertion whenever we heard an ambulance siren. In the last couple of years, we have seen the road show production starring Ted Neely, who had the title role in the movie back in 1976. For an old man he looked pretty good in a loin cloth, except it went all the way up to his rib cage. If he keeps doing this show much longer, his loin cloth will be up to his arm pits. Nevertheless, we might even go back to see him in it again. The music is the music of our youth and brings back fun memories. And when we’re walking into the theater, we know we will see other old, paunchy gray haired people, some of them pushing walkers, with big smiles on their faces. This entry was posted in Opinion on June 24, 2013 by jerrycowling. Autumn has always been my favorite time of year. Winter was too cold, spring had tornadoes and summer was too hot. Autumn was just right. It was also the season of my birthday, Halloween and Thanksgiving. What could be better than that? I never had an actual birthday party because the word “party” sounded too expensive to my mother. Having a couple of kids over for cake and soda pop, that sounded reasonable. Party meant inviting kids who would expect more than just cake. I don’t know what she was thinking about, maybe pony rides and clowns. One year I invited the banker’s son over for cake and my mother said in no uncertain terms he wasn’t invited because we couldn’t afford it. “That’s okay,” the banker’s son replied when I told him. “I just won’t invite you to my birthday party.” I don’t he was going to have pony rides or clowns either. But still birthdays were happy. Mother baked my favorite cake, German sweet chocolate. I always went to the movies on my birthday. Back then the ticket was ten cents for children. Sometimes my parents allowed me to pick a day trip as long as it didn’t include an admission ticket and wasn’t more than hour’s drive away. And I got a present. Getting anything was a big deal. Halloween was fun because of trick or treating. Mother drove my friends and me to nice neighborhoods where the treats were better. Then there was the school Halloween carnival. I liked to see everyone dressed up in costumes. I usually got a mask to wear with my regular blue jeans and shirts. Proceeds went to the PTA so Mother gave me a dollar in change to go from classroom to classroom playing games. Thanksgiving was eating a lot of food that we didn’t ordinarily have the rest of the year. The Macy’s parade was exciting to watch on television. I’d call out to Mother to come see a pretty float. By the time she ran in from the kitchen they had gone on to the next marching band. When I was very small we took turns eating at my aunts’ houses. We saw cousins from exotic places like Fort Worth. I think I liked the cooking of one of my aunts better than my mother’s food. But I’d never tell her that. One year the two aunts decided to have Thanksgiving dinner without us for some reason that was never explained to me. All I know my mother was really ticked off, and Thanksgiving was never quite the same after that. As I think back on it, autumn wasn’t much better than the other seasons, except I did like the weather. Tornadoes, heat and snow can ruin a good time. Now I’m in the autumn of my life, and it’s the best age so far. By the time you get to the autumn of life you don’t have to be uptight because you didn’t meet your goals. You reached the ones you could which means you did the best you could. If you fulfilled all your dreams maybe you didn’t dream big enough. About all anyone can expect out of life is to do the best you can, even though it’s not what you originally wanted. Also, you get surprised by things that you weren’t expecting, sort of like trick or treating. Instead of the hard candy you usually find in your bag you’d pull out a Snickers. It’s been that way with me. I’ve started telling stories to folks of all ages. Most people don’t even know what storytelling is anymore. When television came along we told grandpa to shut up because Marshal Dillon was about to shoot the bad guy. 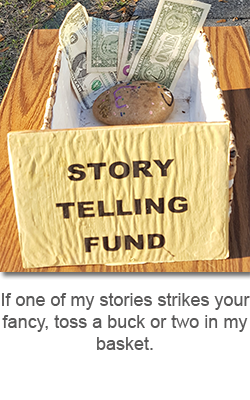 My mission is to bring storytelling back with funny voices, hand gestures, facial expressions and original tales. At first adults and children crinkle their foreheads and say they don’t know what storytelling is. Children especially start out really shy or cynical. When I get going good and my arms are flying and my voice is high, low, loud and soft, they lean forward, their mouths open and then they smile and applaud. It’s like getting a Snickers. This entry was posted in Opinion on June 19, 2013 by jerrycowling. This entry was posted in Stories on June 17, 2013 by jerrycowling. This entry was posted in Stories on June 12, 2013 by jerrycowling. Jimmy Carter was visiting Fort Hood in Central Texas. I was the news editor of the newspaper in nearby Temple. Everyone on the staff was assigned to go to the landing strip to see the president greet the crowd before he was taken off to watch some field exercises. We had to write a story even if it was an interview with someone who got to shake hands with Carter. The editor didn’t go. Someone had to stay in the office to answer the phone. When we got to the fort the runway was lined with military personnel and families. A platform was built for the local press to stand and take pictures. I preferred to walk around and mingle with the crowd and ask silly questions about why are you here, are you excited, etc. Before I knew it, a guy in a T-shirt and shorts introduced himself as a sergeant and started telling me things I knew my newspaper would never print. For instance, Fort Hood staff had to take parts from three vehicles to put together one that would run. He thought they were giving President Carter the wrong image of the Army’s capabilities. Also, he said he was concerned about the level of competency of recruits. He said he had some men in his command who were so dumb they would poop in their pants instead of going to the latrine. Even at that age, I had my smile and nod routine down pat. I could never put any of that in a newspaper article because I was a coward with a family to support. Watergate would have never been disclosed if I had been there instead of Woodward and Bernstein. In the middle of his discourse, a Secret Service agent and an Army officer—both of them huge men—interrupted saying this was an illegal meeting. The young sergeant evaporated into the crowd. They told me the press was only supposed to be on the reserved platform. Like I said, I was a coward so I obediently went to the platform. Incidentally, when I got to the platform, the military families were screaming at us to get out of the way. Jimmy Carter’s plane finally landed, and he went down the line shaking as many hands as he could. He was shorter than I thought and didn’t smile much. One child froze as he had the president in front of him and kept pressing the shoot button on his instamatic but nothing happened. Carter took the camera advanced the film and handed it back to the boy who froze again. The boy’s father grabbed him and pushed through the crowd to catch up with Carter where the picture was finally taken. My story was very insipid, and I was embarrassed to have it on the front page, but after all I was the news editor. The main story, written by the full-time Fort Hood reporter, said the President was impressed by the military power exhibited during the field exercise. Within six months the rescue mission for the Iran hostages failed when the equipment broke down. Carter took full responsibility as commander in chief. I remembered what the sergeant had told me and wondered if the Secret Service agent would have better served the President that day by introducing him to the sergeant and not squashing our illegal meeting. I can’t blame him much though. Maybe his judgment was impaired because he had been out partying too hard the night before. This entry was posted in Opinion on June 7, 2013 by jerrycowling. Clem lived all his life in the mountains of southwestern Virginia, and he didn’t know what to make of all this talk about a Depression. He, his wife and kids got along very well, thank you, in their two-room cabin up in the holler. He planted a patch of tobacco that paid off the damn banker every year, raised a passel of pigs that made good eating every fall, and cooked up the best moonshine for miles around. His wife tended garden so they always had taters, maters and squash, not to mention corn needed for the moonshine. The kids helped their ma with the garden and took care of the chickens. A good person right with the Lord shouldn’t want more than that. One day he was down at the country store talking around the cracker barrel when the preacher’s wife piped up that she didn’t know if she liked the idea of this brand new theater in downtown Abingdon. “Dadburned movie pictures ain’t worth talking about.” Clem spat some tobacco juice in a corner, which was shiny and black from years of being spit in. “You don’t know what you’re talking about.” Clem spat a really big wad this time; in fact, he didn’t have any tobacco left in his mouth. He might as well go on home. “They got a full house every night and two shows on Saturday and Sunday,” Zeke explained. “Defaming the Lord’s day like that. Me and the ladies Bible league are planning to march with signs and scream Scripture at the sinners as they go in next Sunday,” the preacher’s wife announced. On Friday night, Clem showed up at the Barter Theater in downtown Abingdon with the cured ham tucked up under his arm. He didn’t think it would be right for the wife and kids be exposed to all this foohfrah until he saw it first. The theater people seemed right glad to see him and his ham and took him to a seat down front. They told him the name of the play was Hamlet. Now that might be right funny—a play about baby pigs. When the curtain came up, Clem was disappointed. It wasn’t about no baby pigs at all. He could hardly make out what they were saying. It was English all right, but not decent English like they talked in the mountains, but that there fancy English spoke in England. The best he could make out it was about this here college boy who came home to find his daddy dead and his mama married his uncle, and he’s mad because they ate up all the food from the funeral at the wedding, and he didn’t get nothing to eat. Then this college boy sees his daddy’s ghost who tells him his uncle killed him so he could marry the mama. By this time Clem was fidgeting in his chair something bad. He never had no use for college boys in the first place. If he wanted something to eat he should have gone out and shot a couple of squirrels and made himself a stew. Another thing this college boy did wrong was that he had this real pretty girl who wanted to marry him, but he went off and told her to become a nun. And that poor girl got so upset about being told to become a nun that she jumped in the creek and drowned herself. Clem would have just gotten up and stormed out of that there theater, but they had set him down in the front row, and he didn’t think it was proper for him to stand up and keep everybody else from seeing the show. It didn’t make no sense at all. At the girl’s funeral, the college boy’s mama says “Sweets to the sweet.” That college boy jumped down in the grave thinking he was gonna get to eat the candy he thought his mama had thrown on the casket, but it turned out she threw in flowers instead. Clem decided the boy wouldn’t have been so moody if his mama just fed him proper. The end of the show didn’t make any better sense. The college boy and the girl’s brother started a fight right there in front of everybody, and his mama got so upset they’re going to get blood on the good rug that she poisoned herself. When she dropped dead, the college boy decided to take it out on his uncle and ran him through with his sword. Then he dropped dead, probably because he never did get a decent meal through the whole play. As he was walking out, Clem decided he was going to make a stink over this theater thing. “Where’s my ham?” he bellowed out. An older fellow came out of a little office and grabbed Clem by the elbow and took him through another door. Clem decided he got seen to real fast because this man didn’t want the other people to get the idea of asking for their stuff back too. Pretty soon Clem found himself behind the stage where they kept all the people who had put on the play. Those people looked awful worried, and they stepped away from this table with all the vittles that had been brought in that night. There Clem saw the college boy with a big chunk of his ham hanging out of his mouth. This entry was posted in Stories on June 5, 2013 by jerrycowling.